The next bridge upstream carries the Golden Chain Highway (SR 49) over the Mokelumne River. It's a four span cast-in-place box girder bridge (26 0012) on pier walls that was built in 1952. It's 365 ft long with 90 ft long spans and two traffic lanes. It's owned by Caltrans and carries 8300 vehicles a day. The bridge has old style balustrade railing, pier walls (like most river crossings), and a gauge to measure the height of the river. 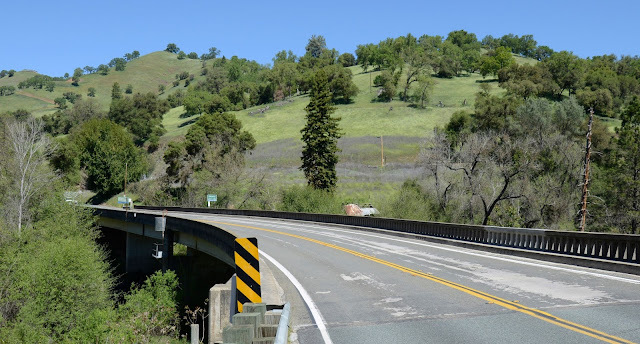 Amador County, California Bridges: State Route 49 across the Mokelumne River by Mark Yashinsky is licensed under a Creative Commons Attribution-NonCommercial-ShareAlike 3.0 United States License.